Are you looking for your first work experience in the hotel industry? What place could be more suitable than the Canary Islands, Mallorca or Spain Mainland? Do you want to brush up on your Spanish skills and spend your spare time on golden beaches? As a student or trainee you can enjoy this fantastic combination in order to gain professional and international experience in one of Europe’s most attractive travel destinations. Work where others are on holidays – internships abroad in sunny places! It is s-w-e-p’s uppermost objective to achieve the greatest accordance possible between the trainee’s wishes and expectations as well as the requirements of our partner hotels. We want the trainee to be satisfied with his/her work placement, so we always try to provide challenging and enjoyable internships abroad. Continuous surveys regarding the quality of our work placement arrangements attest the utmost satisfaction among s-w-e-p’s trainees. Therefore, you will get the best possible placement offer for your internship abroad. The Spanish Work Exchange Programme is the best partner for a successful internship in the hotel industry. You decide about the length of your internship. We recommend 3 to 6 months, although longer or shorter periods can also be arranged. It’s best to apply at the latest 6 weeks before you want to start your internship. Find out what advantages you will get by let organize your hotel internship from the Spanish Work Exchange Programme. Our interns report about experiences they have made and skills they have acquired during their internships abroad. What is also important to know? Do you have more questions about your hotel work placement? Here are the answers. Comparatively, we offer a very low price. 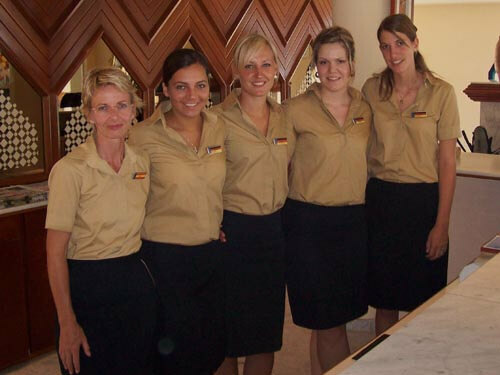 Find out in detail the costs for the organization of your hotel work placement.